Chattooga Assessors Web Site . If the reproduction on the right bears a striking resemblance to what you found in your mail box, then you are, most likely, the lucky recipient of a Chattooga County Real or Personal Property Tax Bill. Not everyone is so fortunate as to receive one of these ... in order to get one you have to own real or personal property IN Chattooga, or else own personal property that is located elsewhere, but is taxable in Chattooga. The item which usually generates the greatest amount of interest in those who receive this little token of the County's esteem, is the item in the red rectangle (note: the red rectangle has been added to this sample bill -- there won't be one on the bill you get.) This is, of course, the brass tacks of what the bill is about -- the amount of advalorem tax due on this property for this tax year. 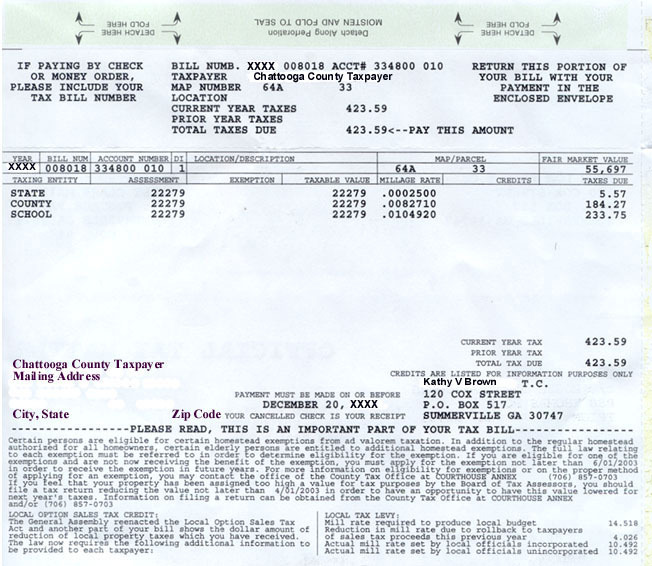 In this sample, the bill is for $423.59. For this example, I am using a property that does not receive any tax exemptions. If it did, then the exemptions would be subtracted from the 40% gross assessement. The resulting net assessement ("Taxable Value" on the sample bill) would then be used in calculating your property taxes. It surprises some people to find out that there are 3 components to their tax bills. In the sample above, the State of Georiga is billing the taxpayer $5.57, the County $184.75, and the County Schools $233.75. for a total of $423.59. The County Commissioner has nothing to do with the levying of taxes by the State or by the County School Board. The County School Board has nothing to do with the levying of taxes by the State or by the County Commissioner. All three entities set their tax rates independently (the State's rate is set by law). 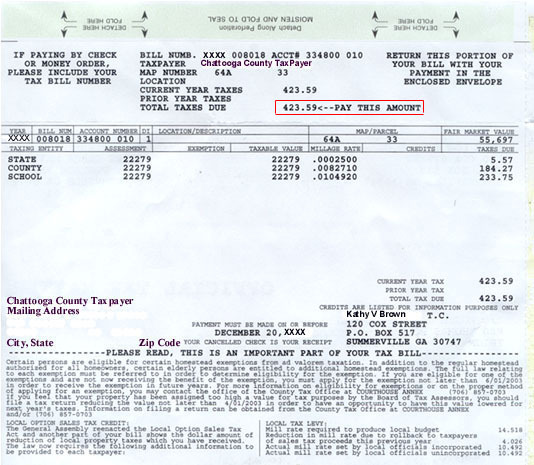 If this property were located inside the coporate limits of Trion, there would be only two portions to this bill -- the State portion and the County portion. Folks in Trion have their own independent school system, so they don't pay county school taxes; rather they pay their school taxes with their city bills. By the way, cut the Tax Commissioner some slack here, will you? She didn't have anything to do with setting ANY of these taxes. Her basic job is to print the bills, mail the bills, and collect on the bills. Yes, she calculates the taxes, but that is done by taking the assessed value we give her and multiplying it by the tax rates she is given by the State, by the County Commissioner, and by the County School Board. She has NO say in the numbers she is given. Barring errors of this nature, what you see on your tax bill IS what you owe. If you're curious as to the consequences incurred by failure to pay your county property taxes .... click here. If you're curious as to how the tax rate is set ... click here.